As an naturalized American, I have always struggled with the idea of American exceptionalism especially considering the injustice I see daily through poverty and food insecurity. Could understanding equity help me appreciate the American idea? Two articles allowed me to start thinking about this question. That all people should have the opportunity to develop and enjoy those rights. This article concludes that the American idea is essentially that “prosperity and justice do not exist in tension, but flow from each other” and that’s what we should be currently defending. While I think I agree, I am concerned that there are too many ways to interpret both prosperity and justice[ii]. Now I can see a way to make a connection between the American idea and equity. Considering this definition and looking at “What the heck does equity mean?”[iv] and “Stop Calling Everything Equity”[v], I think equity is the last statement of the American idea. Thus, we should make sure the American idea continues by giving the most resources, as money, to those communities who have suffered the most injustice so they can have the opportunity to develop and enjoy their rights. FO from 2009: Saving the Best Until Last? 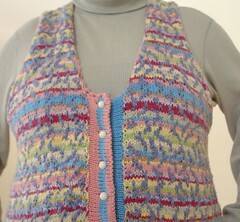 As per usual, I changed the pattern to knit the vest top down. It was still worked back and forth as it is in cotton; I do not know if you can steek yarns other than wool and did not want to find out on this project. Yarn: Mostly Knit Picks Shine Sport plus some Jaeger Pure Cotton. I tried to match KF’s colors but it was hard to tell what a color was by its name. 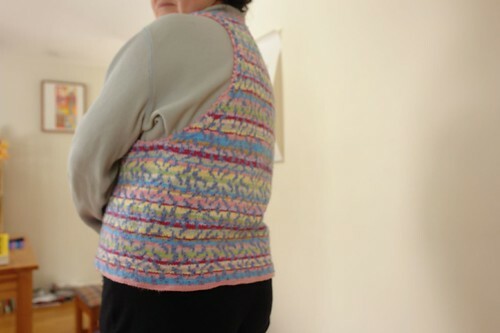 I changed the pattern to a top down vest using Barbara Walker’s wonderful book, Knitting from the Top Down. I also added a wider button band using two colors rather than the picot edging. Oh, while I changed direction I knitted the vest, I followed the charts the right way, so essentially the squiggles are upside down. 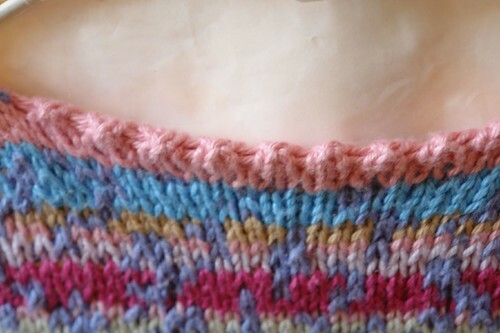 This was the project that killed my needle, remember back in the summer when I had some knitting disasters? Fortunately, it snapped when I was knitting the bottom hem and so there was only one color on the needle. 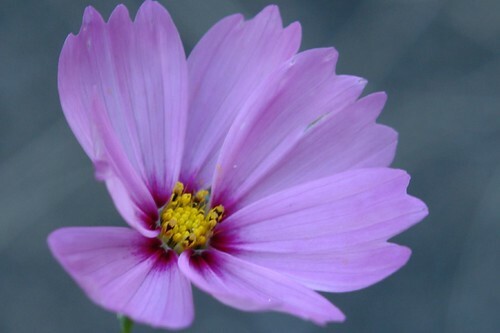 I’ve been blogging since 2005, so my blog is now 4 years old. And I still mean to write more science posts one day! Last Friday, I went to hear Dr Howard Dean talk about health care reform. This is a good article about the meeting. Since that meeting President Obama gave this speech and Dr Dean announced publication of his book on health care reform. Coming from the UK, where there is universal health care, improving coverage in America is very important to me. Please visit Intersection and read about the new initiative that Sheril Kirshenbaum has started in support of women and children throughout the world, particularly in Liberia, who have been raped and sexual abused. Isis has more.